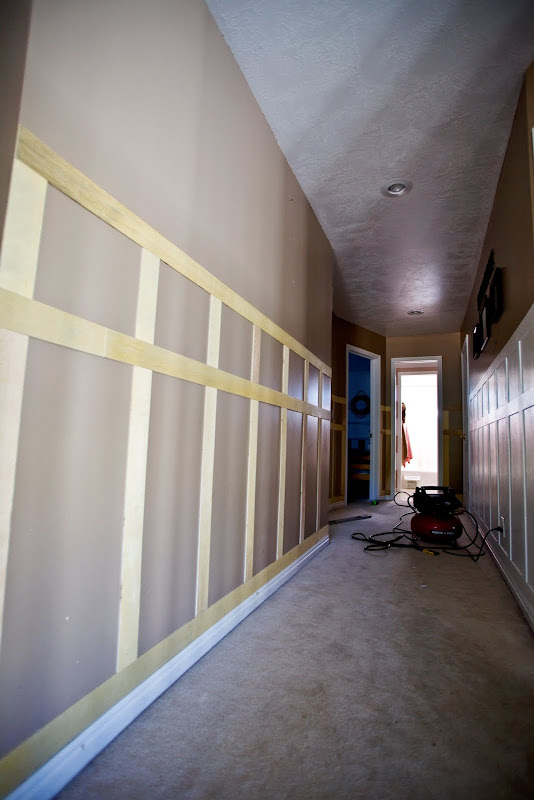 Tidbits from the Tremaynes: Let's Talk About Ze Hallway. Let's Talk About Ze Hallway. 'Cause I want to give you the the low-down. The 411. First I want you to know, that you can judge me all you want. Because I use plywood when I do my wainscoting. Yep. $11, cheap-o, quarter inch, ply. I believe everyone should keep a sheet of ply around for just such emergencies. Aaaah, the freshly cut smell of ply. So, what am I telling you? I'm telling you that the cost of my hallway molding was a total of $11. And I need my projects to be that cheap when I've got a list like I do. I'm not made of money, here! Second, I want you to know about ze doors. So very simple. 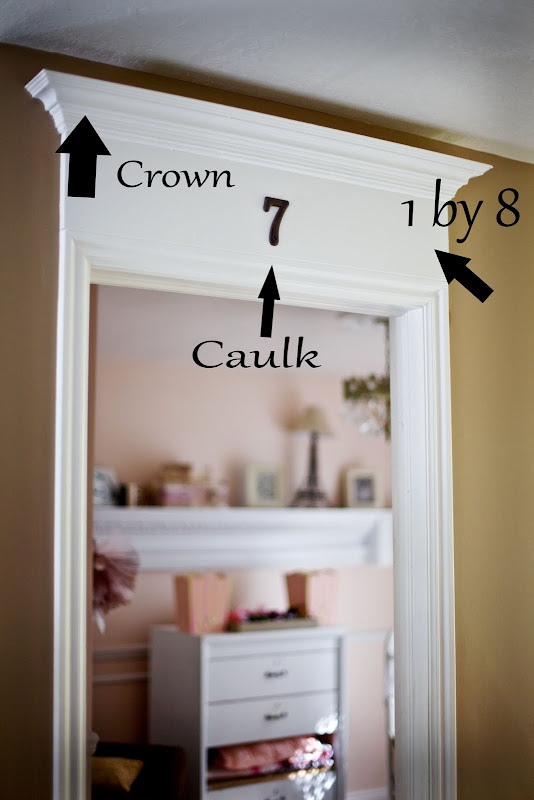 Caulk between your existing molding and your new so it looks more seamless. Spill caulk onto your carpet. Swear. Run out of caulk before you finish all 5 doors. Swear. Okay, okay. So those backcut pieces on the sides are a bit annoying. But that's what spackle's for when they don't exactly meet up, okey dokey? And I would like to take this moment to say, that I love the new molding over my boudoir's french doors. 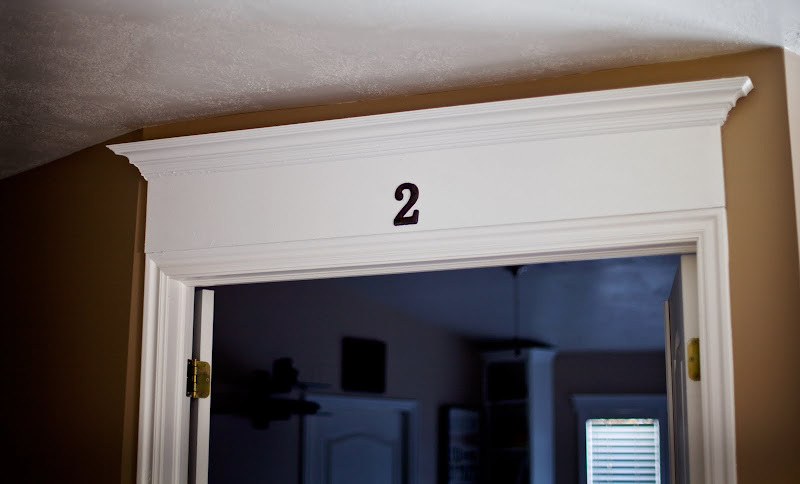 "#2" is the first number we start with in this here hall. Why? 'Cause they (as in the Hob Lob) didn't have a #1, and I'm waaaaay too impatient to wait for a #1 to come in. Plus you know how they tell you that "everything we have is out blah blah blah." And that annoys the crap out of me. Third. Or fourth. I don't even know what number we're on anymore? The mirrors. The large one I bought. The rest, I made. I don't want to talk about those mirrors, because I like them, but they're kind of Monet's. They look great from afar, but up close, they're a real mess. I love my hallway. But take a tip from me, when you blame the bathroom pocket door and it's being "jammed" on your boys, maybe you ought to use the ole noggin', and realize that when you put molding onto that same wall with 2 INCH NAILS, That door's not gonna budge. Plywood - you are a genius. Seriously, because I just spent my youngest child's college education fund on trim at Lowes. Have to remember that one for next time! Too funny about the pocket door!!! I should finish my coffee before posting comments! Love your new hallway! Plywood is genius and I never would have guessed if you hadn't posted. I laughed about the pocket door. My husband put towel rack screws into ours and he thought I got mad and broke the door. Took a few days to figure it out. I couldn't laugh at that moment, but I can now. At least you know you aren't the only one out there that does things like that! we should live by each other.just saying. Oh gosh. Did you feel bad for blaming the boys? What will you do about the door? You know you just gave us hopelessly unskilled folks permission to use nails, right? Cause that is just too stinkin' funny! And so completely something I would do! 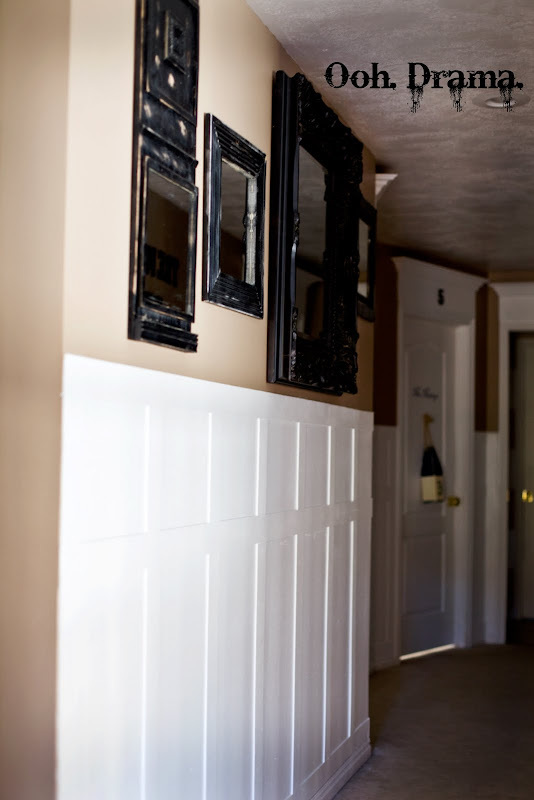 Your hallway looks great...and plywood, who knew?! I need to show this to my husband! This is hilarious. Thanks for keeping it real...always! Girl, That is funny stuff! I think we may possibly share a brain. Soooo glad to hear I am not the only one this stuff happens to! I love your hallway! It is just amazing!! 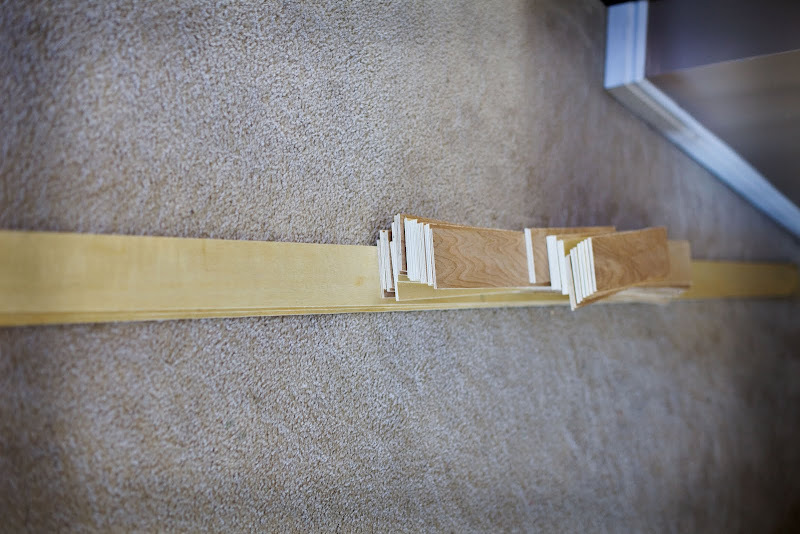 I LOVE how you did the panneling with the 1/4 inch plywood, that is so genius! I want to do this in our upstairs bedrooms, but I was worried about how much all the wood would cost. Not anymore! I am going to copy you because this is brilliant. I love too that you nailed your door into the wall. That's totally something I would do. I think you've just made it possible for me to tackle my hallway this winter...thank you for the inspiration! So excited to hear that I am the winner of your giveaway. I have sent you an email. Wow this is amazing! I have a very similar hallway that I hate. SOOO BORING. I'm going to do this! YAY! 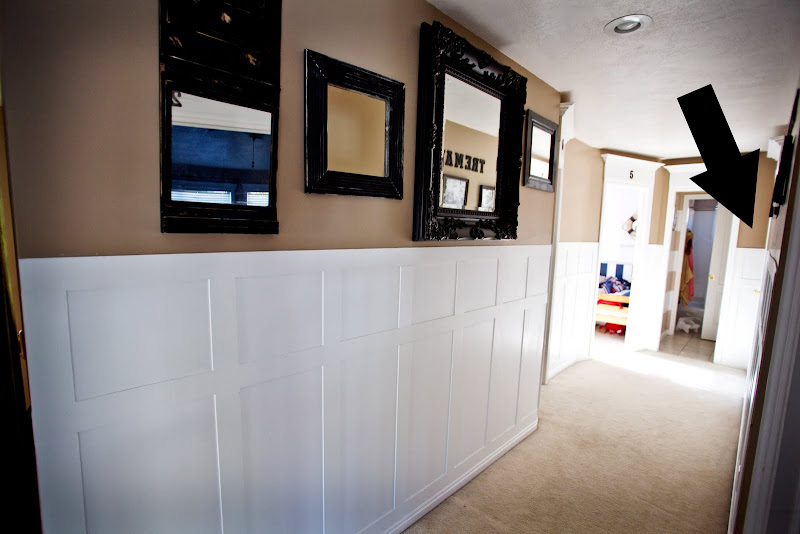 I always use 3 inch wide strips when I do that "wainscoting". I think that's a good width for me. I hope this helps! found you on pinterest! 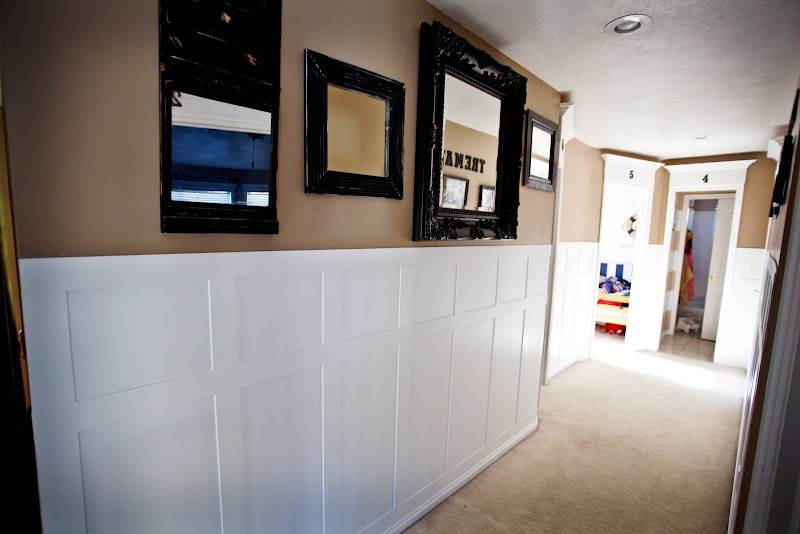 love love love your wainscoting. what did you use to cut your plywood? we would love to do this in our babies room! just looking for a bit more insight into how it was done. its brilliant! How far is the distance in the "squares" ? I know you said 3' pieces around.